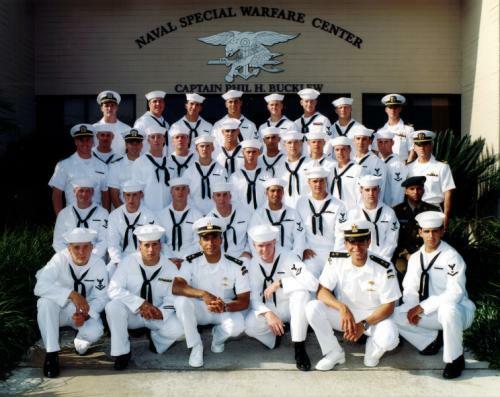 QUESTION: Hello, I saw this picture while looking up a graduation picture of Michael P. Murphy, one of the fallen Navy SEALs from operation Redwing. And I am very confused as to how that person in the army got there. I have heard about how you might be able to double dip from Marine force Recon, but would it also be true for the armys Delta Force?? Because i dont know, but something seems fishy to me. I havent found anything on the soldier in any other searches. ANSWER: Hes not in the US Army, hes a foreign national from somewhere, so are the two officers in the front row. My class had two Thai officers and one from Singapore. My guess is South America. REPLY: Yes, very much, so other nations can have people go through our BUD/S. Ok, that seems weird, but i guess its ok, thank you very much, because that was sort of bugging me.